In 1982, Topps teamed up with Squirt to create a scratch off game where people could win $1000 in groceries, plus get a collectible trading card to boot! 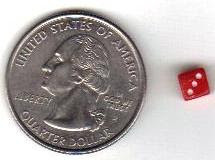 The game pieces had a circle that could be punched out in the top section, then those placed on the necks of Squirt bottles. Somehow, the one I ended up with is not punched! The cards feature the trademark yellow and green of the Squirt bottle's colors. For those that have never heard of Squirt, it was kinda like Mt. Dew, but not. Do they even make Squirt anymore? I have no idea. The entire piece is about 9 inches long and about 2.5 inches wide. The card itself is standard width, but about a half-inch or so short of a standard-sized card. The stock is about half the thickness of a regular card. 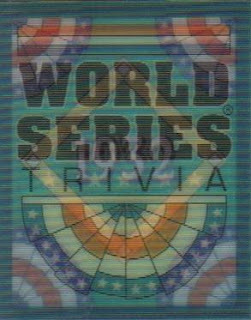 A quick search on eBay revealed that another variety of these features two players instead of a player and game card. 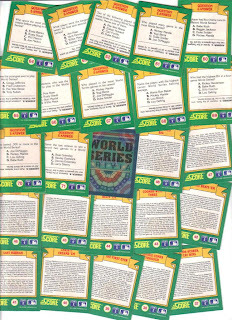 As you can see, Topps may have come up with an original design for the front, but the back is all '82 Topps. 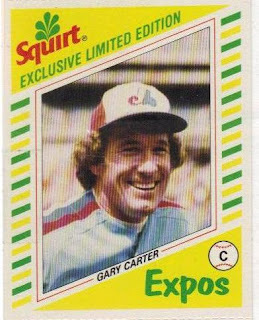 In fact, if I were a betting man, I'd bet it is the back of his '82 Topps card. 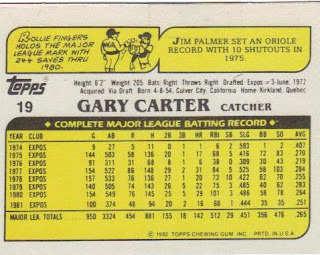 Although, the "Jim Palmer" fact on the right at the top looks way too typewritten to have been on the real card. I could be wrong. I don't have an '82 Carter to compare this with. Pictured above is one scanner bed full of these minis. The full set takes multiple scans. There are 72 cards in the set. 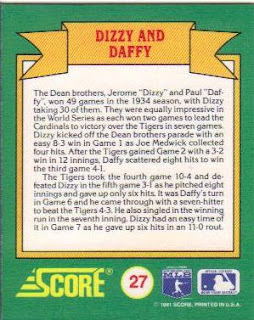 These were special cards that were included in the factory boxes. 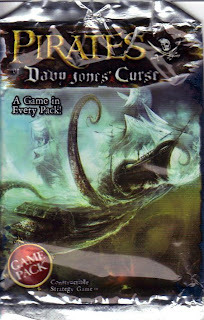 Collectors would also find one motion card per pack off the shelf. Each card measures 2" x 2.5" in size. If you were to ask anyone that either collected these in the 90's or has since discovered them and held them in their collection for any length of time, the first thing that likely comes to mind is the fact that these little cards are stiff as boards and bend like nobody's business. Over time, for whatever reason, the 'stuff' that binds everything together on these cards appears to shrink or tighten. The cards end up bowing in the middle and will not lay flat. In fact, to get the scans, I had to press down on the lid of my scanner. What a weird thing to happen, eh? Wiz Kids Games (an apparent subsidiary of Topps), provides many of the "game in a pack" fodder that one might encouter during a trip to one's favorite (or highly loathed, whichever) retailer. These packs include everything needed for two people to play a game including punchout pieces which often require assembly by very nimble fingers, one or more dies, instructions, and other items that may or may not be needed for gameplay. Some titles include: "Nascar Race Day," "Star Wars Pocket Model TCG," Pirates," and others. They also make the "Action Clix" games, but I have not bought any of those as of yet. 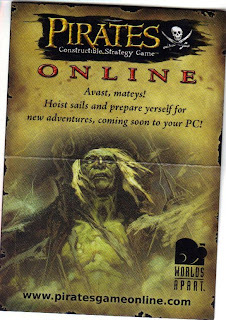 For the purposes of this post, as mentioned above, I will examining a pack of "Pirates" cards. I do have a "Nascar" pack that will appear at a later date on "A Pack to be Named Later" as well. Each pack is a complete Pirates game (with two ships, a die, rules, etc). In order to really show these off, I scanned both sides of each playing card and then combined those into a "Side 1, Side 2" picture. Each card is about the size of a regular/standard trading card, but is the thickness of a credit card. That's a good thing, because the assembly is a TINY feat, and anything thinner would tear like toilet paper. Next, is part two (because Blogger loads pictures in reverse order and I didn't realize this was #2 until writing this), of our second ship, Hangman's Joke. Why part TWO? Ah, you see, some ships are more complex and require two playing cards to complete. See? Aren't we having fun? 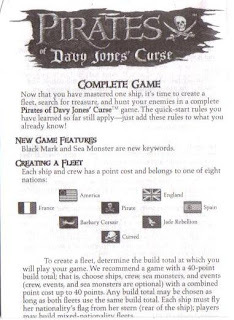 Assembling the ships not only requires you to punch them out of their cards, but to also be able to line up and insert tiny tabs into tiny slots (please reserve all crude comments for the tavern). 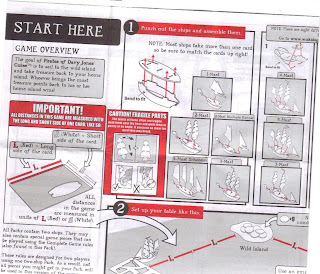 Because these are pirate ships, they are also curved, making it that much more fun to assemble. The little flags that hang off the back of each ship is very small, and will most likely be the first pieces lost after a few rounds of play. But, WAIT! There's more! In addition to the cards, each pack a set of "Quick Rules." These give you enough to play a scaled down game without concerning yourself with things like Trogs. 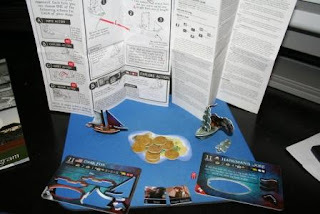 The Quick Rules provide a picture-based step-by-setp guide for assembling the ships and for playing a beginner's (or basic) game. It's pretty easy to follow. And here we have the die that comes with the game. I used the ubiquitous US Quarter for sizing reference. It is "Small... esS... emM... All... Small!" 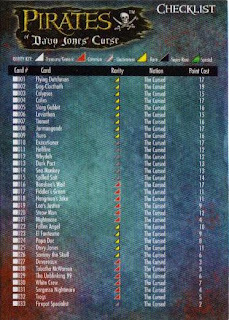 There is also a foldout checklist, in case anyone in their state of insanity wanted to collect every piece of the game. What you see here is page 1 of 4, and it is the size of a baseball card.